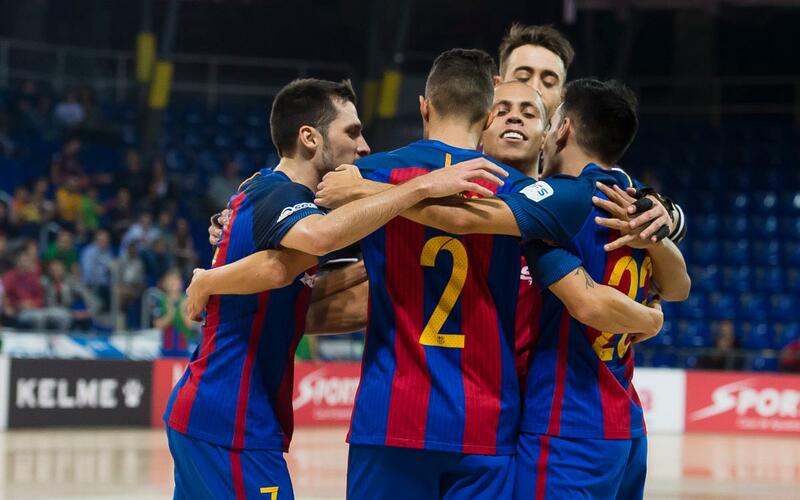 FC Barcelona Lassa futsal team continued their positive run with a 4-2 victory against Gran Canaria at the Palau Blaugrana in the fourth LNFS fixture of the season. The game was electrifying and it could have gone either way. However, in the end goals from Ferrao, Adolfo (2) and Marc Tolrà gave Barça the win leaving them only three points behind leaders Movistar Inter. The Catalans started strongly and looked to attack throughout the game with Joselito especially prominent. Plaza's men pressed high up the pitch and the opposition looked to get in behind the barça defence giving the match a frenetic pace. In the 11th minute Ferrao went close from a free kick before the Brazilian swivelled and scored the first goal of the game a minute later. In the second half, Gran Canaria's defensive fragility was exposed and Ferrao came very close to doubling Barça's lead in the 25th minute before Adolfo finally scored from a set-piece. However, an unfortunate Joao Batista own goal from a Bingyoba shot kept Gran Canaria within touch (2-1). Gran Canaria went for broke in the final two minutes using the player-goalkeeper tactic, which allowed Marc Tolrà to score with ease. However, the team from the Canary Islands responded quickly and Bingyoba got one back. With the score at 3-2 and only eight seconds on the clock Adolfo managed to find the back of the net giving Barça a 4-2 victory at the final whistle. Now, with nine points, Barça will atempt to keep their good run of form going away to CD Burela, who are eleventh in the league.